Microsoft Security Essentials (MSE) is a free anti-virus, anti-spyware and anti-malware program from Microsoft, which is now probably one of the most popular free antivirus security software for PC. MSE is available as free download for genuine Windows users as alternative to pricey premium security solution. To provide comprehensive protection, Microsoft Security Essentials comes with daily free virus signature update. Although free, Microsoft Security Essentials manages to proof itself to be a reliable security solutions. However, sometimes Microsoft Security Essentials can fail to update its virus and spyware definitions signature database. Actually, the main problem is that Microsoft Security Essentials does not update the virus and spyware definitions according to schedule. The failure to update virus and spyware definitions problem arose from the fact that MSE is set to check for updates once every 24 hours by default. And, MSE will also check 10 minutes or so after boot or wake from sleep if there is a network connection and whether the current updates are greater than 24 hours old. If the conditions are true, MSE will grab new update from Microsoft Antimalware server automatically. For some PCs which regularly go into sleep mode, standby, or hibernation, and miss the scheduled update check, Microsoft Security Essentials fails to play catch-up to update the definitions database when the computer wakes up or back online. To make matter worse, the status of the virus and spyware definitions is always up to date despite no update been done until after 7 days, where MSE will only consider the computer with seven-day-old signatures to be at risk. As signature update and client updates are handled in MSE client (MSE pipes the update process through Automatic Updates), so no signature update will be offered via Windows Update. While waiting for Microsoft to fix and patch the occasional unable to auto update virus and spyware definitions error, here’s a few steps that user encounters the issue can take to ensure that Microsoft Security Essentials automatically update as and when needed. Microsoft Security Essentials, although depends on client program to perform both client and definition update, but it still depends on the pipe of Automatic Update service (wuauserv) and directly, Background Intelligent Transfer Service (BITS) to carry out the udpate. So, ensure that wuauserv and BITS is running (via Control Panel -> Administrator Tools -> Services) or else MSE won’t update. Microsoft Security Essentials can be forced to or manually update. To do so, just open up Microsoft Security Essential user interface, go to Update tab, and click on the Update button to check for updates. Manually update will allow user to know if there is underlying problem with updating mechanism of MSE, or just the automatic update fails to perform the task. 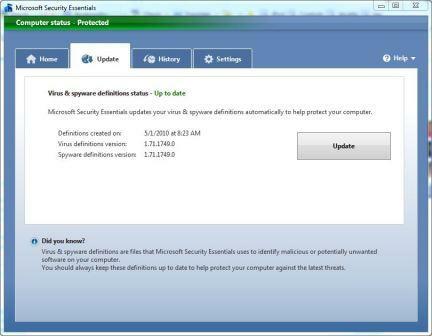 This is a workaround for system where Microsoft Security Essentials does not or fails to check and update its virus and spyware definitions automatically. The trick is to schedule automatic scan on the system, and force Microsoft Security Essentials to check for new signature update prior to commencement of scan process. To do so, open up Microsoft Security Essentials user interface, go to Settings tab, select Scheduled Scan option. 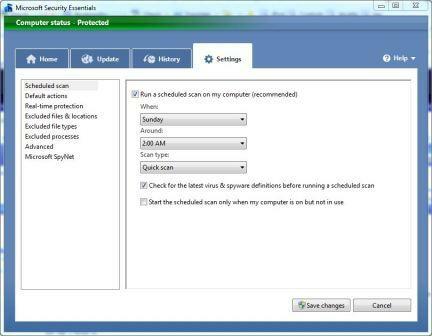 Ensure that scheduled scan is enabled (Run a scheduled scan on my computer (recommended) check box is ticked) with daily interval, and check the checkbox for Check for the latest virus and spyware definitions before running a scheduled scan option. Unselect and uncheck the check box for Start the scheduled scan only when my computer is on but not in use so that scheduled scan will always run, and so do automatic virus signature update. Microsoft is making available latest version of full engine and definition package from the Microsoft Malware Protection Center. User can download the package for free, and apply it to a PC running MSE, especially on computer without Internet connection. The default 24 hours signature update interval of MSE may prove to be too long for some computers, as most computers are not leave to be running 24 hours everyday, causing Microsoft Security Essentials not updating virus and spyware definitions database to be out-of-date and put the computer at risk. With a simple registry hack, Microsoft Security Essentials can be instructed to check for updates more than once a day (default is every 24 hours – once a day). Follow the guide below to change the registry key to allow MSE to check and update virus and spyware definitions signature database every few hours. Ability to perform and update process more frequently also able to solve the issue when MSE does not update its definitions database automatically. In the right pane, take ownership and grant full control permissions on a registry key, a REG_DWORD value named SignatureUpdateInterval. Double click on the SignatureUpdateInterval. By default, its value is 24 (in Decimal) or 18 (in Hexadecimal). Change its value to any number between 1 and 24 (both inclusive) in Decimal. The numerical value determines how frequent and how fast (in hours) Microsoft Security Essentials will check for updates and update the virus and spyware definitions.